Traveling by train in China is quite a normal experience for Chinese people. 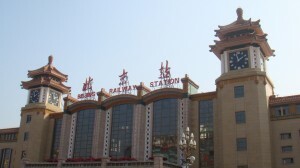 The railway system in China has been well developed in recent years. Besides the normal fast trains, more and more high-speed trains are coming into operation. 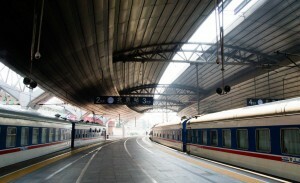 The following are the steps you should do if you want to take trains in China. Step 1 Buy a train ticket. 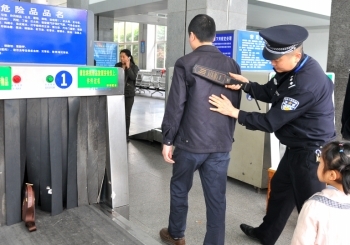 In China, real-name system is applied for railway ticket purchase. Chinese Identification Card is most commonly used in China, for tourists from overseas, a valid passport can be used for ticket purchase. There are three ways to buy a train ticket in China. One method is to buy one at the railway station, the other two methods are online or by telephone. 1) How to buy train tickets at the railway station The pre-sale period of train tickets from train stations or ticket offices in China is 58 days(including the booking day). If you would like to buy tickets in train station, you can buy one at the ticket window with your passport. Another place you could buy the tickets is the ticket offices. These offices are not in the railway stations.They scatter in the city and you can easily find one in your neighborhood. There will be a CNY5 service charge for per ticket in the office. 2) How to book a ticket online. The per-sale period of train tickets online is 60 days(including the booking day). The official booking website is www.12306.cn. So far, only Chinese version is available. It requires a real-name registration and a China UnionPay Card. Therefore, it is not convenient for foreign tourists who cannot read Chinese. We ChinaTour.Net offers an online train booking service. We have train schedules in English. It will be very easy for you to find your target train. Then, we will book the ticket for you. Only a few service fee charged. After the confirmation of the booking, you can print out the paper ticket by yourself at the train station or require us to deliver it to your hotel. 3) Book a train ticket by telephone. So far only Chinese version available. Note: The train tickets is usually short of supply during Chinese public holidays, especially on the Chinese National Day holidays and Spring Festival holidays. Step 2 Get to the railway station. Step 3 Enter the station hall. When you arrive at the railway station, you need to show your passport and train ticket to enter the station hall. Then, you luggage will be examined by the X-ray machine to check if there are items that are not allowed to take on the train. Step 4 Find the right waiting room. The waiting room is assigned according to your train number. There are LED bulletins showing the train numbers and the corresponding waiting rooms. If you have trouble to find the right waiting room, ask the working staff for help. Usually there are more than one ticket entrances in the waiting room. There are signs with the train number and the platform number on it at the ticket entrance. At most cases, check-in starts 30min before the departure time in a starting station. It is advised to arrive at the train station one hour earlier. If it is an intermediate station, there will be only a few minutes to check-in. After checking in, just follow the flow of people and get to the platform. Step 6 Board the train. The carriage number and the seat number is printted on the ticket. The carriage number is just outside the carriage. For each carriage there is a working staff standing at the door who will require you to show your ticket to make sure you board on the right carriage. Find your seat number or sleeper number. You can put your luggage on the shelf. If you bought a sleeper ticket, the working staff will check your ticket and exchange your ticket with a boarding card. Before the train arrive, you will have your ticket back. Step 7 Get off the train. When the train arrives at each station, there will be an anouncement. When the train arrives, you can pack up and get off the train. Step 8 Get out of the station. There will be an EXIT sign. Or you can just follow the flow of people and you will go out of the station. For high-speed trains, your tickets will be checked again by machine. For other trains, the working staff will check the tickets randomly. So put your ticket away before you get out of the station. 1. 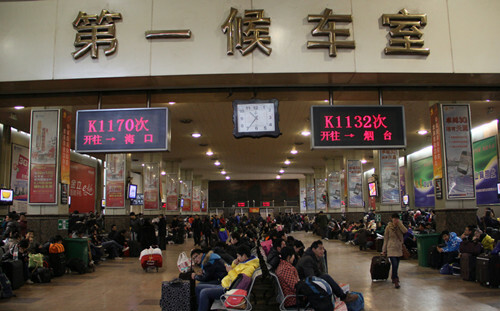 Since China is a populous country and train travel is a major means of transport, you will always find there are many people in the train station. It is part of Chinese feature, just get used to it. 2. Take care of your belongings. Put away your valuable belongings in your carry-on bag and take it with you. 3. The train is sometimes delayed especially on Chinese public holidays. When there are too many people, the scheduled stopping time will be not enough for the passagers to get on or get off the train. So the train will be delayed. 4. Do not release your private information to strangers. Do not drink or eat food given by strangers.